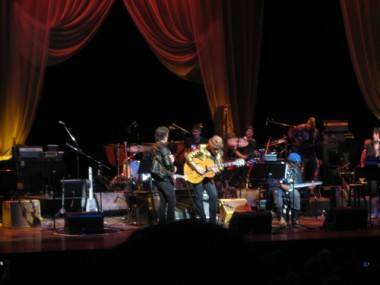 Lou Reed onstage with Elvis Costello at the Neil Young Project at the Orpheum Theatre, Vancouver, Feb. 19 2010. Shawn Conner photo. Rolling Stone is reporting that Lou Reed has passed away. He was 71. Though the cause of his death has yet to be released, it is known that the singer underwent a liver transplant in May of this year. Two of his most recent projects include the album Lulu with Metallica and The Raven, an album based on the work of Edgar Allan Poe. Reed first came to prominence in the 1960s, as songwriter and singer with the Velvet Underground. Many of the songs he wrote for that seminal group are considered classics today: “Rock and Roll”, “What Goes On”, “Pale Blue Eyes” and “Heroin” among them. Reed brought a streetwise, poetic sensibility to his lyrics – he was an acolyte of the poet Delmore Schwartz, an early inspiration whom Reed would acknowledge throughout his career. The song was from Reed’s second solo album, Transformer. That 1972 album also contained several more of what would come to be regarded as classics, including “Vicious”, “Perfect Day” and “Satellite of Love”. As Reed’s influence spread through new generations of musicians, more and more people would mine his back catalogue, and this album was prime source material. U2 has covered both “Perfect Day” and “Satellite of Love”. Reed’s output between 1975 and 1989 tended to receive mixed reviews, but several songs from this period stand out for this writer, including: the title track to to Street Hassle (1978, later covered by Simple Minds); the title track to The Blue Mask (1982); “Bottoming Out”, from Legendary Hearts (1983); “I Love You, Suzanne” (an actual charting single!) from New Sensations (1984); and “Video Violence” from Mistrial (1986’s). But in 1989, Reed reentered the cultural conversation in a big way. New York, his love letter to New York City but also a state-of-the-nation address, was one of the most acclaimed albums of the year. It was the right record at the right time, presenting Reed at the height of his talents just as a new generation of musicians (and particularly songwriters) were discovering both his solo and Velvet Underground work. There are too many great songs on this record to mention, but if you’re familiar with New York, here are a few titles to jog your memory: “Romeo Had Juliette”, “Dirty Boulevard”, “The Great American Whale”, “Straw Man”, “There Is No Time”. If you’re unfamiliar with Lou Reed, this is a prime gateway. Nearly as powerful (and, some might say, superior) was the follow-up, Magic and Loss. The album was reportedly inspired by the death of two close friends, including the songwriter Doc Pomus, who gave Reed his start in the music business, according to Wikipedia’s Magic and Loss entry. From this album, the song “Sword of Damocles” has always struck me as particularly powerful – never more so, in fact. Lou Reed released four more albums after Magic and Loss, including Set the Twilight Reeling (1996), Ecstasy (2000), and Hudson River Meditations (2007), a collection of meditational music. Reed will be missed. To be totally corny and cliché, I hope he’s up there with Lester Bangs, giving a 180-gram vinyl pressing of Metal Machine Music a spin and boasting about being ahead of his time. This entry was posted in news and previews, the latest and tagged Andy Warhol, Lou Reed, Music, obituaries, Velvet Underground. Bookmark the permalink. My lifespan is basically Lou Reed’s – I’m 66 – but I never knew much about him; never really listened to his lyrics. Thank you for your well-written and comprehensive obit. Thanks for the kind words, Nancy. Thanks for posting about Lou Reed’s death. It’s weird when one of your favorite musicians dies. I’ve got to be honest, I haven’t listened to much of the work Lou did in recent years, but I’m still kind of sad I won’t get the chance to hear any more songs from him. Now when I listen to “Satellite of Love” I will not take it for granted!